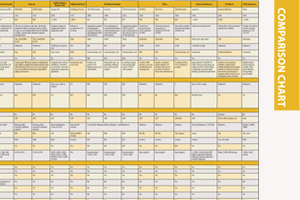 This article appeared as the introduction to the Treatment Planning Systems comparison chart. Treatment planning is a critical component of a patient’s road toward an optimal outcome when dealing with cancer. Whether the ultimate goal is palliative or a total cure, treatment planning always aims to provide just enough dose to a targeted area to eradicate the cancer, while sparing nearby tissue or organs. Today’s treatment planning software includes a number of features to achieve this outcome. In addition, new refinements continue to take advantage of technology improvements in imaging and radiotherapy modalities as they develop. One example is the ability to speed up dose calculations using collapsed-cone algorithms, because computers today are faster. Collapsed-cone algorithms historically have been more accurate than pencil-beam algorithms, but took significantly longer to run. Speeding up the process of calculating dose distributions using the most accurate methods gives planners an opportunity to develop alternative plans for comparison more easily. This enhances the outcome for the patient. Also helpful is that many plans’ algorithms can calculate dose distribution for various treatment modalities now, including photons, electrons, protons and brachytherapy. There also have been improvements in simulation. Many plans can create 3-D models from any DICOM 3.0-compliant image set, so they can integrate computed tomography (CT), magnetic resonance imaging (MRI) and positron emission tomography (PET). Multimodality images can be fused and contouring tools have been improved to achieve a quicker process. Some systems also have 4-D functionality, which enables the treatment planner to account for motion as well. • Nucletron, which offers Oncentra treatment planning software, highlighted some innovations at the European Society for Therapeutic Radiology and Oncology (ESTRO) Congress in London in May. Prostate Solutions, built around Oncentra, combines treatment planning and delivery with advanced robotic accuracy to improve clinical outcomes in patients undergoing prostate brachytherapy. It covers both high dose rate (HDR) and low dose rate (LDR or seeds) in one configuration. The latest version of the Oncentra Brachy brachytherapy treatment planning system features library plans and GYN applicator models, the first in a series of applicator models. Nucletron says the new libraries and automatic reconstruction can dramatically reduce the time needed for planning without compromising on quality. The company also showed two systems for external beam treatment planning — the latest release of Oncentra External Beam, which connects to all treatment delivery systems, and Velocity, which has the ability to combine images from multiple modalities, integrate dose summation regardless of source, and apply adaptive contouring across multiple datasets. • In January, Elekta received 510(k) clearance from the U.S. Food and Drug Administration (FDA) for software used for planning spot scanning. XiO treatment planning software is used with proton therapy. Spot scanning is a delivery method that involves constructing a highly conformal dose to the tumor by using thousands of small individual beamlets instead of a single large beam. This approach enables intensity modulated proton therapy (IMPT). • Similarly, at the Particle Therapy Cooperative Group meeting in Philadelphia in May, Varian Medical Systems highlighted its ProBeam proton therapy system and Eclipse treatment planning for IMPT. Eclipse recently received FDA 510(k) clearance for use with the company’s IMPT delivery systems in the United States. The goal of IMPT is to shape the dose distribution so that it matches the shape of the targeted tumor in all three dimensions. The latest Eclipse release has the ability to analyze the robustness of a treatment plan in terms of its ability to optimally cover the tumor and reduce dose to healthy tissues. • MIM Software received FDA clearance in April for a new brachytherapy treatment planning system for permanent seed implants. The MIM Symphony module can integrate MRI, CT and molecular imaging for more accurate contouring. It features the new ReSlicer tool, which allows images to be reoriented easily for treatments requiring needle insertions that aren’t precisely perpendicular to the imaging plane. • Brainlab just received 510(k) clearance from the FDA for its HybridArc radiosurgery planning package. It is intended to increase the efficiency of existing linear acclerator radiosurgery hardware and offer high-precision volumetric arc radiosurgery treatment without the need for hardware upgrades. It uses an adaptive dose calculation matrix that takes into account the different parameters affecting dose distribution to provide the necessary precision when opting for stereotactic radiosurgery. It uses software automation to calculate plans quickly. It combines enhanced dynamic conformal arcs and static-intensity modulated radiotherapy beams in the same plane for an efficient volumetric radiosurgery dose plan that takes only seconds to optimize.